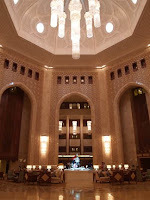 Living in Singapore: Oman: Al Bustan open for business....really? Oman: Al Bustan open for business....really? Having previously partaken of afternoon tea at the Al Bustan, we made a booking for high tea at the hotel which has undergone almost two years of refurbishment. At the security checkpoint a gentleman questioned the purpose of our visit and asked for our names while attempting to remove something from his ear. Clearly, any name would have sufficed. Walking from the car park, we noticed workmen spray painting external walls while lines of blue overalls moved around the grounds like ants. The atrium was quite stunning – the gaudy gold and blue has been replaced by a subtle cream and brown colour scheme, which when finished, will look very nice. There was a strong smell of paint and glue and the sound of grinding and drilling echoed throughout the marbled chamber. An elegantly dressed lady escorted us to a table past a group of men working frantically on the central (water?) feature. There were no other guests. This had to be a joke. What were they thinking? After a brief family debate, we left to find somewhere more, well, finished. Driving up the road to the Shangri-La, we looked back at the Oman D ive Centre to see the bay filled with cocoa-coloured water from the red tide which still lingers after all these weeks. 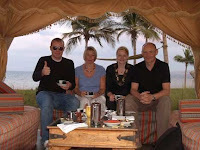 The sight of canopied seats overlooking the beach at the Bandar hotel was considerably more inviting than the Al Bustan. 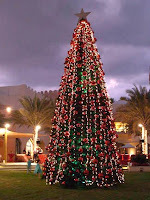 An e normous Christmas tree clad with giant red baubles towered above the palm trees as teams of technicians worked on electrical equipment for the British School Muscat’s Christmas concert later that night. The sound system was tested with various British Christmas pop classics and one of S Club Seven’s greatest hits. After tea, we wandered along the beach at sunset past lines of palm trees and shrubs covered in twinkly lights, eventually returning to the Christmas tree centrepiece. It almost felt like Christmas. Later that evening, Floss built Bowdach a deck chair and sunglasses while Al prepared four superb hand-crafted pizzas.